Should Rocky Boycott The Oscars? Cree’'s Sylvester Stallone has sa’d he's considered staying home on the big night. We consider his consideration. This, to me, is the juiciest development yet in the Oscars backlash. My reaction comes, first, from the gut: Creed was my favorite movie of the year and, goddammit, it deserves to be up there in Best Picture. But my reaction also comes from my understanding of how the Oscars work, and what it is the Academy values. The Academy, for better or for worse, is a bastion of tradition. Its demographics—dominantly male, dominantly white, dominantly old as hell—are atrocious. But its mission statement is not: Movies are dope. There should be a stodgy institution tasked with celebrating and preserving their traditions. Now that said—considering the kind of fundamentally traditionalist movie that Creed is, and the “respect your elders” manner in which Coogler went about making it, it feels almost inconceivable that only Sly would get nominated. And it means that Stallone boycotting the Oscars—an act which he apparently did at least consider—would have been all that much more powerful. The Rocky franchise is one of Hollywood’s most cherished traditions, and rightfully so. But for Coogler—then coming off his stirring indie smash Fruitvale Station—to tackle it seemed career-endangering-ly foolish. The franchise was tarnished by 1990’s ignoble Rocky V; after 2006’s Rocky Balboa failed to really move the needle, the franchise was left for dead. Coogler, acting with the verve and superciliousness of the young upstart he indeed was, heeded no warning. In Creed, we meet Michael B. Jordan’s Donnie. Full name: Adonis Creed. Lineage: the lost child of Apollo Creed, the greatest fighter that ever lived, and Rocky’s one-time foil, rival, martyr, and best friend. Refashioning Rocky into the young Creed’s avuncular mentor was a clever, tradition-respecting twist. And overnight, it breathed life into the franchise. But Coogler didn’t just save the once-proud, long-tattered name of Rocky Balboa: he brought the man himself back into Hollywood’s embrace. In his fifth decade in show business, Stallone was, technically, doing fine—being that deep in the game and still being employed is its own stalwart accomplishment. But it’s a long way from shooting yet another Expendables sequel in the dodgier parts of various Eastern European tax-havens to palling around with Spielberg at the Oscars luncheon in Beverly Hills. Stallone is a Hollywood icon. Coogler—who, it should be noted here, worked hard just to talk Sly into doing this movie—has now given him a late career moment befitting that status. At the very least, he got Stallone out of downtown Bucharest. Coogler didn’t stop there. He worked with Irwin Winkler and Robert Chartoff, the original producers of Rocky, on Creed. He resurrected the original theme but, with lovely restraint, he never fully indulged: in scene after scene, the movie flirts around and weaves in interpolations of the trumpet blasts of Bill Conti’s legendary “Gonna Fly Now.” Ultimately, Coogler imagines the sound of his own, modern hardscrabble Philadelphia, one populated by the revved engines of the city’s dirt bikes and the yelps of the city’s Meek Mill. A bold step into the future—but not without a big respectful nod to the past. This practically defines the mission statement of the Academy. Now a word about that future. 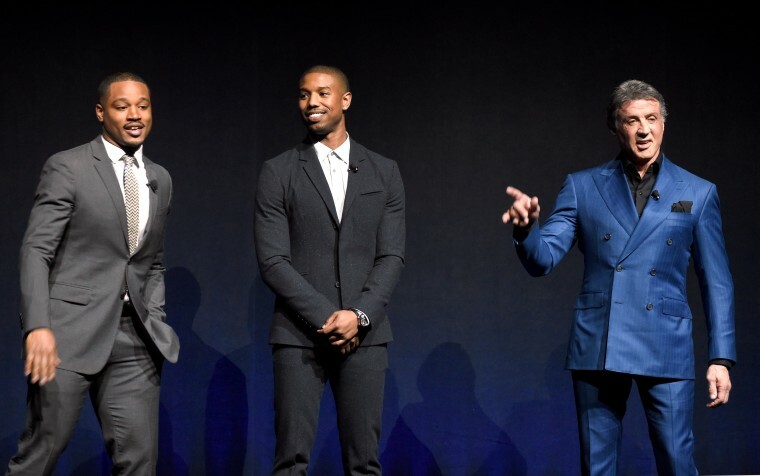 For years, Michael B. Jordan has been confidently marching toward the Hollywood upper echelon. And rightfully so: he is as as handsome, humble, and charming a candidate for A-list inclusion as we’ve had in a long, long time. With Creed, Coogler gave Jordan the biggest platform he’s ever had. And Jordan delivered. There was room for Creed in Best Picture: the Academy nominated eight movies for the category, which means two more nominees could have been eligible (the somewhat archaic voting rules for that category are available here). There was room for Jordan in Best Actor. With respect to Bryan Cranston, his nomination for Trumbo seems the most obvious bit of institutional bias. The movie made $8 million to Creed’s $187 million, received respectable reviews, and played a limited theatrical run. And so I ask this earnestly: how in the hell did Cranston get in over Jordan? Ultimately, though, I don’t care about the logistics of who should have gotten snubbed instead. A few weeks ago SNL tackled the Oscars backlash with an awards show sketch in which a string of white men are honored for ancillary roles in films starring strong black leads. They explicitly draw attention to Rocky and Adonis, and it’s incredible how little they need to do to parody the situation. In another clever twist in Creed, Coogler upended cliche by making Adonis a rich kid who throws away a cushy office job for the blood and brain trauma of the ring. You look at that, and you wonder: if Adonis had been something the Academy was more familiar with, would they have paid Creed more respect? If Coogler had instead fed the Academy the cliche they were expecting—if he’d given them another troubled, poor black youth—would things have turned out differently? And then you look at Coogler’s accomplishment and the traditionalist, respectful way he went about accomplishing it, and you wonder, what more could he have done here? And you answer, nothing. And you ask, is it not too late for Rocky to reconsider that Oscars boycott? Coogler, being a gentleman, did not get in Stallone’s way. So now the choice is Sly’s alone. Another tux, another speech, another afterparty. Or stay at home, and really make a memory.